“AIDS Healthcare Foundation (AHF), the US’ largest non-profit HIV/AIDS healthcare provider, which provides medical care and/or services to more than 100,000 individuals in 21 countries worldwide, is honored to announce the grand opening of the Church St. AHF Magic Johnson Healthcare Center, AHF’s first ‘all-in-one’ site–and the first of its kind in the nation. In addition to the Magic Johnson clinic, the new facility includes an AHF Pharmacy, an Out of the Closet thrift store and free HIV testing–all in one location. “California State Senators Mark Leno (D-San Francisco/San Rafael) and Leland Yee, Ph.D., (D-San Francisco/San Mateo) will help AHF officially open this new venture in the fight against AIDS, with a ribbon-cutting ceremony on Wednesday, September 30th at 10am at the new AHF Magic Johnson Healthcare Center located on 100 Church St., San Francisco, CA 94114, adjacent to AHF’s Out of the Closet thrift store…. “All of AHF’s sixteen healthcare centers–located in California and Florida–provide comprehensive, patient-centered care designed specifically for HIV-positive clients, offering access to the additional specialists, medications and services they need to be as healthy as possible. This newest facility is AHF’s fifth clinic named in partnership with and in honor of HIV-positive basketball legend Magic Johnson…. “In addition to providing specialized expertise for people living with HIV/AIDS, AHF Pharmacy also offers the community a friendly, personal and not-for-profit alternative to the large, retail pharmacies. AHF Pharmacy is a full-service pharmacy, able to fill any prescription and open to everyone–HIV-positive or not. Revenues generated contribute to caring for AHF patients as well as supporting its prevention and testing programs worldwide. As its spokesperson in print and television advertisements, actor and activist Blair Underwood has urged widespread use of the AHF pharmacy as an opportunity to help others…. An updated sitemap is a search engine’s favorite thing about web sites because search engine’s love updated, fresh information. or another search engine and see if you can find interesting blog topics you haven’t blogged about yet. What is scavenging? It means paying as little as possible for everything — or paying nothing at all, preferably. Does the quest for free stuff and cheap stuff send your pulse racing? Then welcome home. You're one of us. 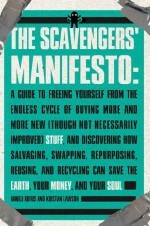 Buy The Scavengers' Manifesto at Amazon or Barnes & Noble.